"All I want in life is to be happy... It seems funny to me, how fucked things can be. Every time I get head, I feel more dead." So goes "Dead," the intro track to Issues, Korn's fourth studio album. And, although I luckily can't relate to Jonathan Davis on this issue, this track gives a preview as to what the rest of the album is going to be. This is not Follow the Leader, but then again it is not Life is Peachy nor is it the self-titled album. Issues is an amalgam of all three - a musical head-trip through the history of rock's current obsession. Korn has been a veritable force in the hard rock arena ever since their debut album in 1995 They garnered a strong, constant, fanbase between through their self-titled album and Life is Peachy. However, it wasn't until Follow the Leader in 1998 that Korn received their pop status. With such radio and MTV hits as "Got the Life" and "Freak on a Leash," Korn broke out of their cult status and made their mark on the world as the innovators of rock music. The consensus came in, their sound was to be the future of rock. 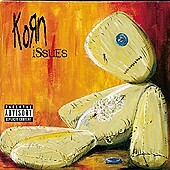 1999 - Follow the Leader has only been out for about a year, yet Korn has already released another album. This time they are making an album "for the fans." Issues takes the band back to their roots more than FtL did, incorporating a darker sound, harder guitars, deeper bass; an overall more ominous album. This album is Korn. There are no collaborations. The video for "Falling Away From Me" (the first single) is simply disturbing, thank God for that. There is no sunshine, no shiny suits, no Ferraris - it is dark and threatening; a sign of what the album is. In the album's sixteen tracks, there is nothing meant to put a smile on your face. Korn has become an emotionally charged band again. And, while nothing will ever be as emotional as their self-titled release, Issues is still one of the most heartfelt albums of the year. Rage Against the Machine's Battle of Los Angeles has been called a possible album of the year, but Issues blows it out of the water. Korn is using a lot of variations on their old riffs, but they are also incorporating new instrumental effects as well. The guitar crunch is as hard as anything they have done before, but the technicality of playing has improved greatly over the past four albums. Jonathan Davis has put his heart back into his lyrics. This is another album of torment. However, before you write it off as just another album about torment, take into account the life Davis has lived. Each of these songs has meaning - there are no pointless pop lyrics here - just true heartfelt emotion; no matter how disturbing those emotions may be. There are a few new additions to the style on this album. First off, there are a lot more vocal effects put on Jonathan. This can take away from the pure anger he puts out, but the way the effects are used allows for a more psychedelic anger - more distant than before. Another difference is that Jonathan actually sings on some tracks - especially "Hey Daddy." The album also incorporates a few shorter tracks of about a minute each. These tracks are some of the more innovative ones, especially "Wish You Could Be Me." Despite a few shortcomings, this is still one of the strongest rock albums of the year. It is definitely the most emotional. Above all, it is quite possibly the most highly anticipated albums of the year. While nothing will ever take the place of their debut, Issues is the closest the band has come. Far and away superior to Follow the Leader, this is Korn again. They have gotten their immense listener base, and now it is time for people to listen. Besides, there are finally bagpipes again.